Last weekend, Disney scored in a big way with Ralph Breaks the Internet , which brought in $84.7 million over the five-day Thanksgiving holiday. Creed 2 also delivered the goods, hauling in $56 million and beating expectations. This weekend, with no major releases going wide from other major studios, both of these sequels are, once again, set to repeat atop the box office for a second straight week. Wreck-It Ralph 2 will take the top box office spot with estimates putting its second week total at around $33 million. But positive word of mouth and lack of competition could push it closer to the $40 million mark. Thus far, this has proved to be the most successful sequel Disney Animation (not counting Pixar movies) has ever produced. Frozen 2 may have something to say about that next year, but for now, it's Ralph and Vanellope claiming that crown. 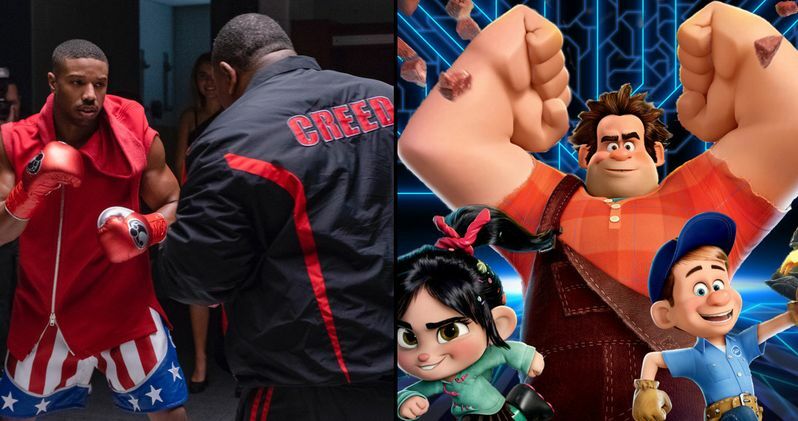 Don't be surprised to find that Wreck-It Ralph 3 is in development sooner rather than later. As it did last week, Creed 2 will come in second place, with estimates placing the eighth movie in the Rocky franchise with $17 million for its second week. Again, good word of mouth could push it closer to or over the $20 million mark. Coming in at the number three and four spots respectively should be Fantastic Beasts: The Crimes of Grindelwald and The Grinch. It's going to be a tight race, as both movies will be dancing around the $17 million mark, give or take a bit. Really, the two through four spots this weekend could all be quite close. The top five should be rounded out by the Queen biopic Bohemian Rhapsody, which has already made $473 million worldwide and, come the end of this weekend, it could be closing in on $500 million, making it one of the biggest hits of the year. The only major newcomer this week, the exorcism horror The Possession of Hannah Grace, is going to barely make it into the top ten with estimates putting it somewhere in the $3 million range on the low side and $7 million on the high end. Needless to say, this won't be a big hit for Sony. Also worth looking out for is Oscar hopeful The Favourite, which stars Emma Stone and Rachel Weisz and expands into more theaters this weekend. Also worth keeping an eye on is the zombie Christmas musical Anna and the Apocalypse, which opens in select cities this weekend, but will expand nationwide the following week, just in time for the holiday season. Be sure to check out our top ten weekend box office predictions below and check back with us on Sunday for a full list of estimates. These numbers were provided by Box Office Mojo.